Pro-Mark introduces its newest multi-purpose drumstick. Pro-Mark has added another model to their line of brushes. Pro-Mark has added another model to its line of marching snare drum sticks. 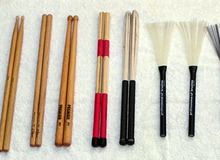 Pro-Mark has added another model to its growing line of “Performer Series” mallets. Vater is expanding their Xtreme Design Series with the addition of three new models, Warrior, Punisher and Destroyer.